The fingerboards of violins, violas and cellos are the most touched surface on the instruments and can wear out easily. 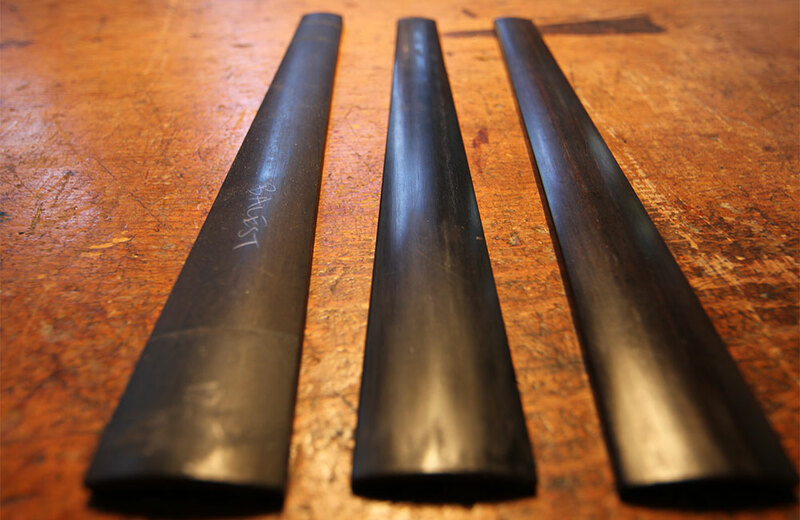 Thus, the durability and high quality of an ebony fingerboard, along with its smooth texture and attractive color, is necessary for any serious instrumentalist’s use. It is the wood of choice for the violin maker who crafts fine instruments. Ebony is an unusually dense, dark-colored wood, dense enough to sink in water. Different species of ebony trees have origins in India, Sri Lanka, West Africa, Mauritius and Indonesia. Its beautiful, darker tones and fine texture have made it popular as an ornamental wood. When polished, ebony has a fine, smooth finish that will retain its texture for many years. Handmade ebony fingerboards are dried over several years to achieve the highest quality of material. Ebony fingerboards are much higher in cost but worth the extra investment. Warping and shrinkage are at much greater risk with the less durable rosewood fingerboards and especially veneered fingerboards. Ebony is easy to reshape and resurface, unlike veneered fingerboards, which are easier to replace than to repair. As fingerboards should match peg and tailpiece materials, a dark color is the favored aesthetic for these parts in violinmaking for its contrast with the red and brown tones of the violin body. Darker ebonies have been prized for centuries, although the lighter ebonies, black with dark brown streaks, are more durable. Blond woods like Rosewood and Fruitwoods show fingerprints more easily and require more cleaning and maintenance. Painted fingerboards, though cheaper, fade and lose their color and may require retouching and further repair. Professional violinists, violists and cellists need a reliable wood that endures wear while providing a quality aesthetic to their instrument. Ebony is unbeatable for its durability, as well as its color and texture, which bring visual appeal to both the instrument and instrumentalist.